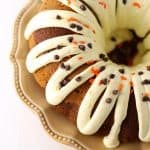 Pumpkin Chocolate Swirl Bundt Cake is gluten-free pumpkin and chocolate cake swirled together in a Bundt pan with orange icing and mini chocolate chips. 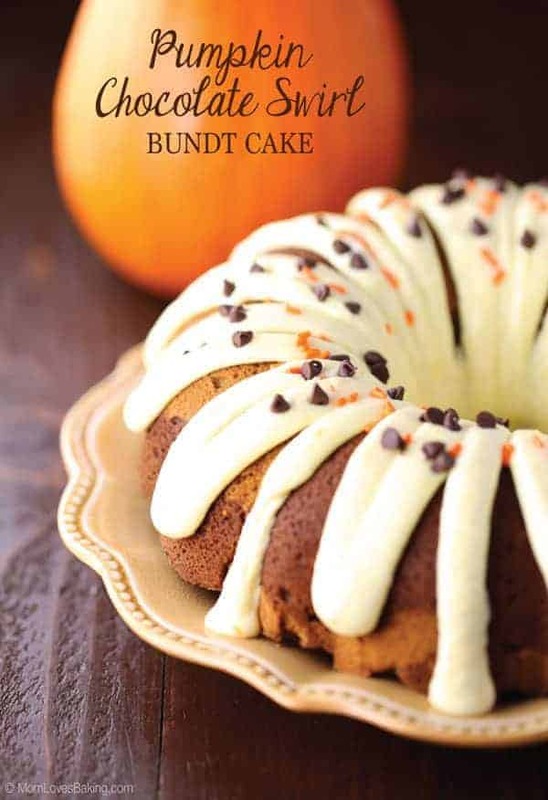 Pumpkin season is in full swing and I’ve got another great pumpkin recipe to share! This is another gluten-free recipe, but honestly, you would NEVER know it! In fact, my husband had TWO pieces last night and he still has no clue that he ate something gluten-free. If I had told him it was a gluten-free cake, he would have not touched it with a ten-foot pole! And I’m not even kidding! 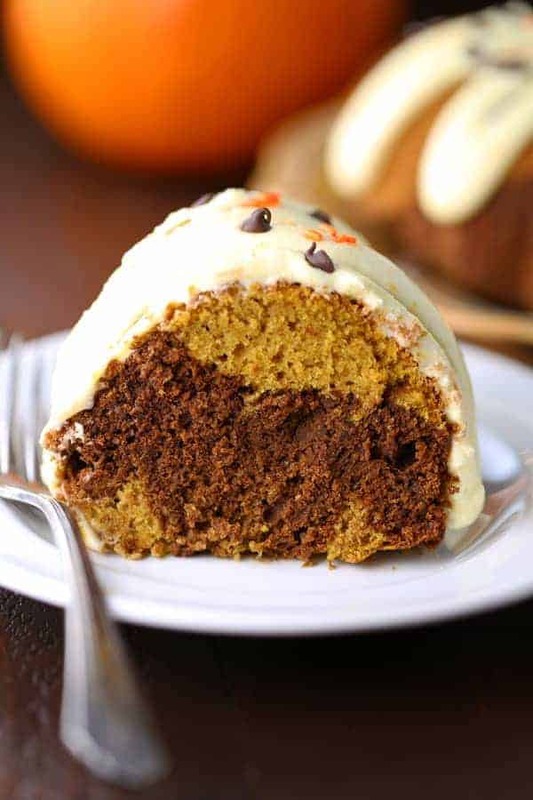 This Pumpkin Chocolate Swirl Bundt Cake is so, so good. 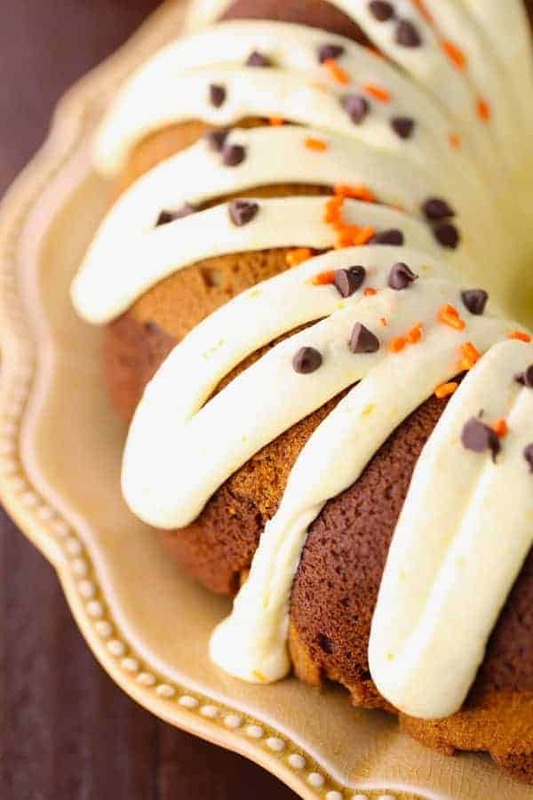 It’s got a little bit of chocolate cake and a little bit of pumpkin cake swirled together, then topped with a fresh buttercream frosting infused with the zest of an orange. I love the combination of these flavors. 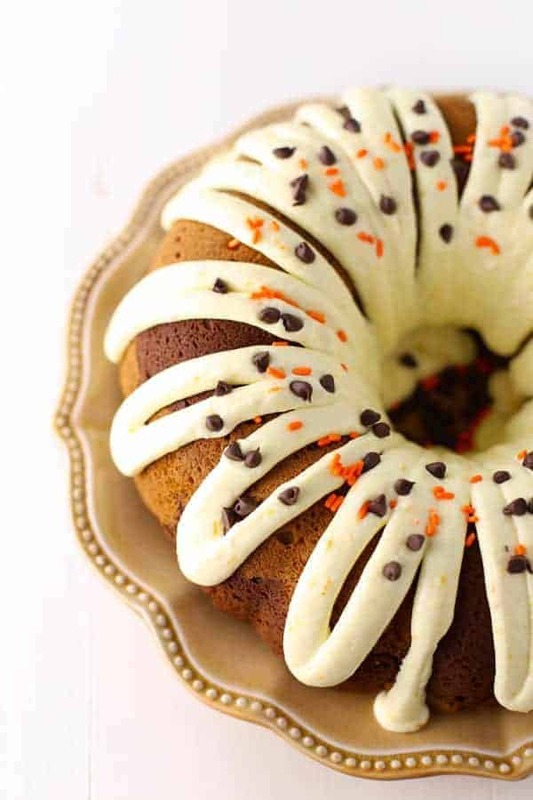 Chocolate, pumpkin and orange all go so well together! I added these ingredients to the cake mix in a large bowl, then beat with an electric mixer until completely combined. Divide the batter in half. Reserve one half, then mix in melted chocolate in the other half. Generously grease a Bundt pan with butter, then swirl the two batters together. Bake at 350°F. for 40-45 minutes. Mix up your buttercream and frost the cake. I put the frosting in a ziploc bag, then cut off a corner and piped the frosting on top. Garnish with mini-chocolate chips and sprinkles. 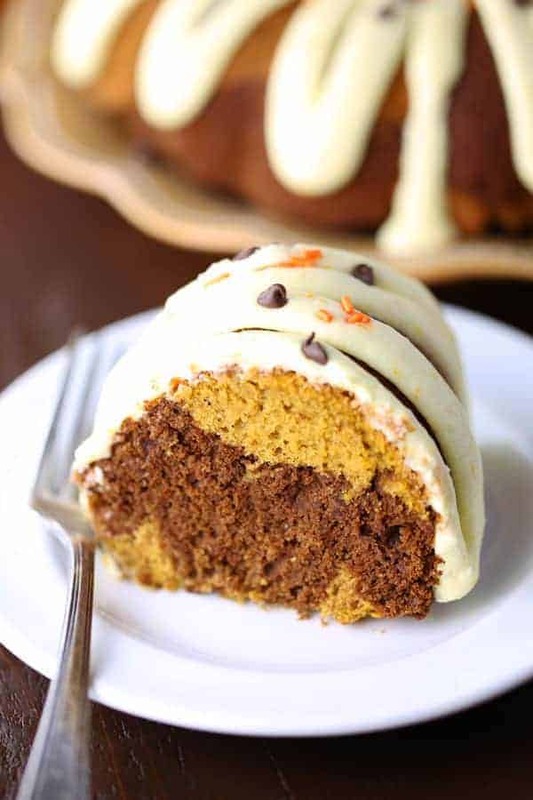 Pumpkin Chocolate Swirl Bundt Cake is simply scrumptious! A fabulous dessert for anyone, whether or not you can have gluten! Preheat oven to 350°F. Grease a Bundt pan generously with butter. Set aside. 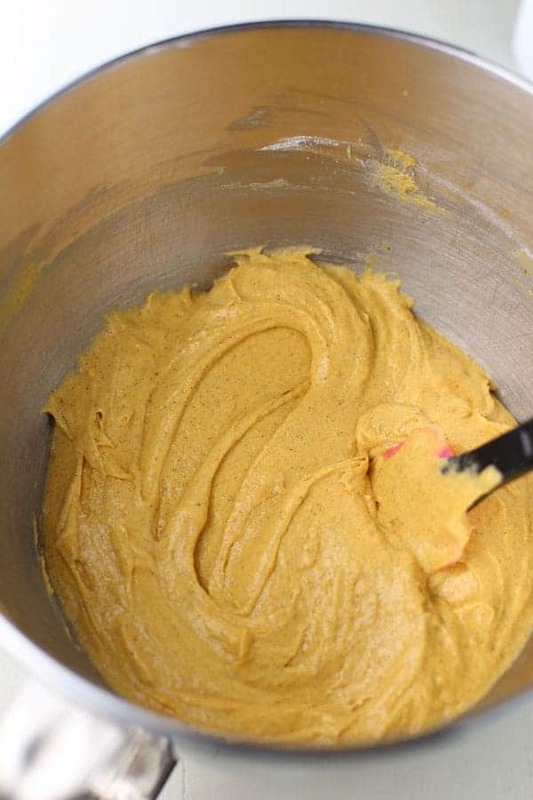 Place cake mix in a large bowl. Add pumpkins, eggs, butter and pumpkin pie spice. Mix on low for 30 seconds. Turn up to medium and beat for 2 minutes. Divide batter in half. Reserve one half. Add melted chocolate to the other half. Add alternating spoonfuls of each batter in prepared pan. 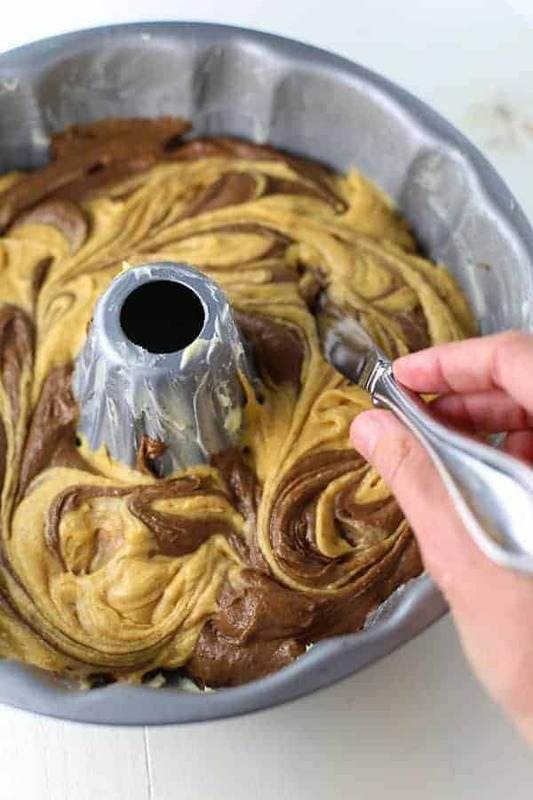 Use a butter knife to swirl the batter together. Bake for 40-45 minutes or until a toothpick inserted in the middle comes out clean. Let cool. Meanwhile, prepare frosting. Place butter in large bowl. With electric mixer, beat on medium until creamy. Gradually add the sugar and water. Add zest and beat on medium high until smooth, about 2-3 minutes. Pour frosting in a ziploc bag. Seal and cut corner, then pipe frosting on top of cake. Add garnish, if desired. Store covered in refrigerator for up to 5 days. You are right, pumpkin chocolate and orange are fabulous together! This cake looks really delicious! That swirl makes for such a pretty cake! 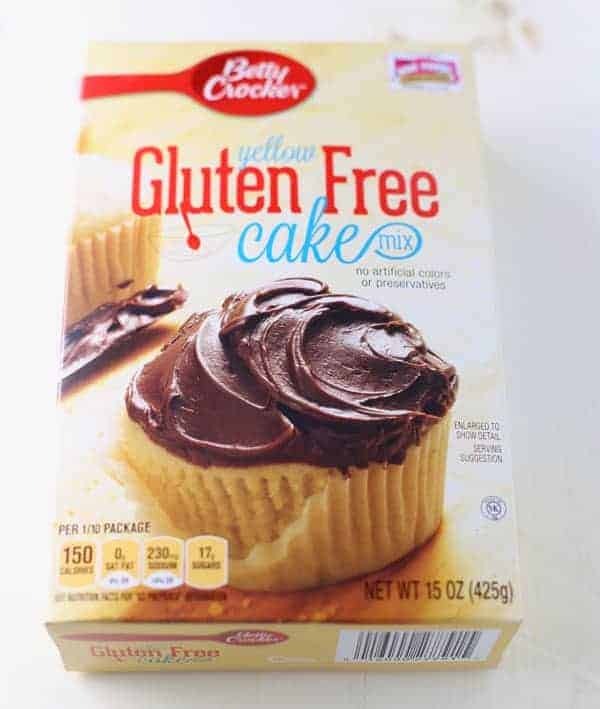 Pinning this recipe to make for my gluten free niece!